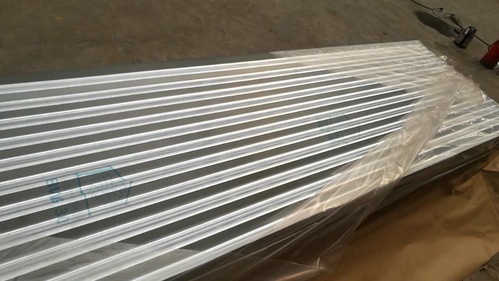 Galvanized Corrugated Sheets are manufactured using best grade steel and is widely applied in construction industry. These sheets can remove disposal and tear-off coats when installed over shingles. Our range of sheets is known for their uniformity in thickness and is extensively used in industrial, agricultural and residential applications. Ideal in extreme humidity, heat, wind and precipitation, these sheets are widely demanded in the industry. We offer these sheets in various sizes to meet the different demands of the clients. Packaging Details Wooden Seaworthy Export Packing Boxes in 12 mm Commercial Plywood With Other Material In Pine Wood of Nut Bolt fitting System For Your Sheet Packing. The Material Utilized For Packing Base Is Hardwood With Frame Of Pine Wood In Nut Bolt Fitting Type With 12 mm Commercial Plywood. Established in 1984, Excellent Engineering Company is a renowned Manufacturer, Supplier and Service Provider of Industrial Automobile Washing Machine, L and T Platform, Waste Compactor, Manual Semi Gantry Crane, Injection Plastic, Molding Machine Base Frame, Food Packaging Structure Fabrication Work, Industrial Shed Fabrication etc.These and all the other products in our inventory are precision engineered by a team of highly qualified and skilled professionals. Trained and skilled in the use of modern equipment and technology these professionals ensure the production of flawless products that deliver excellent functionality and long service life. We source the best raw material from reliable vendors to fabricate our products. Each of these products and all the material engaged in their manufacturing are duly scanned for quality and standard compliance by a team of highly skilled quality auditors. It is the efficiency and capability of our team that enables us to offer innovative products to our customers always. To ensure their greater work efficiency we train them regularly through seminars, programs and other training sessions.